This is a post by Arthur Lynch. Arthur is a PhD researcher in muscle physiology, an international-level raw powerlifter and coach here at Sigma Nutrition. I was recently sent a link to a T-Nation article titled “Tip: Do Quarter Squats To Boost Athleticism” (original piece here), with a request for my opinion on the conclusions drawn by the author. The article is a summary and interpretation of a recently published study by Rhea et al. (full text here). In that study the researchers compared the effect of training quarter-, half- and full-depth squats on performance in the full squat, half squat and quarter squat. They also looked at 40 yard dash time and vertical jump performance. So no surprises here, you train through a certain range of motion and you get better at it, the principle of specificity in action. Taken together, these pieces of content motivated me to write this short article to help guide people who may havemistakenly taken this to mean they should be using quarter squats instead of full squats. When interpreting research, it’s important to note that every study has its limitations and needs to be interpreted within the context of those limitations. It is also important to remember that before you read a study you need to be aware of your biases. As a powerlifter and powerlifting coach who promotes the use of the full squat, it’s a fair argument to claim that I may hold a positive bias towards full squats and that I may be biased against quarter squats. I am aware of this possibility so I will proceed in a manner where I will not let this cloud my judgement. The important thing is not that you are right; the important thing is getting the right answer! Conversely, is someone is reading this with a favourable bias towards quarter squats, I’d ask they aim to be objective and be open to the possibility of their initial thought process being incorrect. Because of the obvious biomechanical differences between the three squat variants, subjects in the quarter squat group used heavier loads than the half and full squat groups. Whilst the authors made reference to this, no data were provided on what the subjects actually lifted throughout their respective training programmes. As the absolute load used by the quarter squat group was greater than the half and full squat groups, this distorts the comparison between groups for training volume. The traditional way to quantify volume is to multiply the load used by the number of sets by the number of reps. But because the distance travelled was not equated this makes it difficult to compare training volume (a key predictor of outcomes) between groups. Whilst the authors make reference to a coach being present and providing feedback on depth during training sessions, the exact coach to athlete ratio was not disclosed (i.e. it is unclear if there was one coach present when all subjects were training, in which case some athletes could have been squatting incorrectly, or if more coaches were present). On the surface, it would appear that quarter squat training is better for vertical jump and 40 yard dash performance. However these results need to be put into proper context so that we don’t jump to conclusions prematurely. This study showed that 16 weeks of quarter squat training in 10 subjects was superior for vertical jump and sprint performance compared to a group of 9 subjects who trained full squats over that same time period. That is the extent of the findings here. In addition, the subjects’ training protocols prior to the beginning of the study were not disclosed. It is plausible that the subjects in the quarter squat group were not training hard prior to the study and as a consequence saw greater improvements at the end of the 16 week training period. Also as previously mentioned, by prescribing the same relative intensities for each group, the absolute loads handled by quarter squat group were greater than those in the full squat group. Additionally, the quarter squat is likely more specific to a vertical jump than a full squat, which may account for greater improvements using this test. Results may have been different if another test was used such as squat jump or a broad jump. In terms of how this study sits within the body of the available literature, the only two studies I could find that also investigated this question found full squats to be superior for jump performance (Hartmann et al. 2012; Bloomqvist et al. 2103). However these subjects were not as well trained. 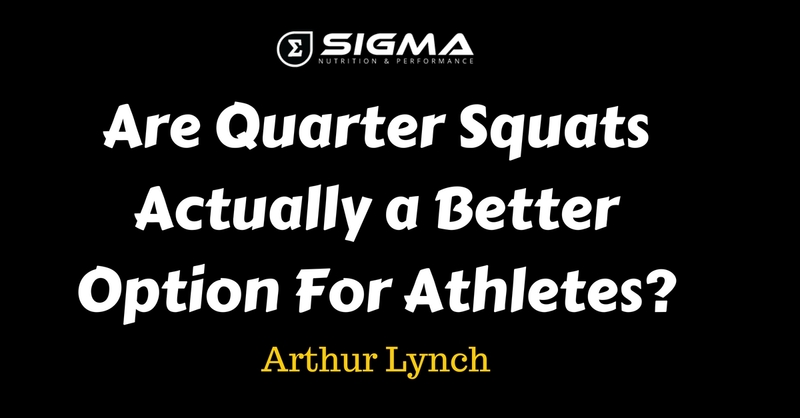 Quite simply, the evidence provided from this new study is insufficient to conclusively say that quarter squats are superior to full squats for athletic performance. Whilst this was a fairly well thought out study design, there are some inherent limitations. Most notably the use of heavier loads in the quarter squat group and the relatively small sample size. Perhaps in years to come, after more studies on this topic have been published, we will be in a position where we can consider quarter squats to elicit a superior training effect than full squats. Who knows. But for now we are still in the “stay tuned” stage. However one thing that this study does do quite well is challenge our beliefs. Many people would cast the idea of using quarter squats in strength and conditioning programmes aside as heresy. However this study indicates there may well be a place for them. In theory, depending on the athlete and the demands of their sport, quarter squats could be quite useful. For example a basketball player who wishes to improve their vertical jump. In contrast, a rugby player for example needs to be strong and powerful in positions with greater hip and knee flexion angles will likely derive more benefit from full squat training. In addition it remains to be seen if quarter squat training would likely strengthen the musculature and connective tissues to the same degree as a full squat, and thus providing the same protective effects against the likelihood of getting injured. In which case the athlete may in fact be better off training the full squat. In summary, there may well be a place for quarter squats in the strength and conditioning programmes of certain athletes, however the evidence is not strong enough as of yet to say that they should be used in place of full squats. In addition, for hypertrophy and strength, larger ranges of motion still appear to be superior.